Little children will have fun matching the picture and word stickers to the pages as they build their vocabulary in this interactive first word book. With sylish illustrations and a hundred everyday words to discover, this is a fun way to learn English as a first or second language. 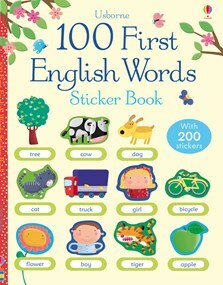 Includes over 200 stickers to add to the pages and a pronunciation guide to listen to at Usborne Quicklinks.